Copyright ©The Author(s) 2015. Published by Baishideng Publishing Group Inc. All rights reserved. Author contributions: Choi SS performed the literature review and wrote the manuscript; Kim SH performed the literature review; and Kim YK performed the literature review and provided expertise and critical revision of the manuscript. Conflict-of-interest statement: The authors report no conflict of interest. The importance of the safety of healthy living liver donors is widely recognized during donor hepatectomy which is associated with blood loss, transfusion, and subsequent post-operative morbidity. Although the low central venous pressure (CVP) technique can still be effective, it may not be advantageous concerning the safety of healthy donors undergoing hepatectomy. Emerging evidence suggests that stroke volume variation (SVV), a simple and useful index for fluid responsiveness and preload status in various clinical situations, can be applied as a guide for fluid management to reduce blood loss during living donor hepatectomy. Synthetic colloid solutions are also associated with serious adverse events such as the use of renal replacement therapy and transfusion in critically ill or septic patients. However, it is uncertain whether the intra-operative use of colloid solution is associated with similarly adverse effects in patients undergoing living donor hepatectomy. In this review article we discuss the recent issues regarding the low CVP technique and the high SVV method, i.e., maintaining 10%-20% of SVV, for fluid management in order to reduce blood loss during living donor hepatectomy. In addition, we briefly discuss the effects of intra-operative colloid or crystalloid administration for surgical rather than septic or critically ill patients. Core tip: The low central venous pressure technique can still be effective for reducing blood loss during hepatectomy. However, it may not be advantageous regarding the safety of healthy donors undergoing hepatectomy. Therefore, to reduce blood loss during donor hepatectomy, we propose an alternative fluid management technique using a high stroke volume variation method. For the type of fluid, the use of a non-lactate-containing crystalloid solution is advisable during donor hepatectomy. Colloid administration should be carefully determined depending upon each clinical situation of donor hepatectomy, although future studies will be required to elucidate the effect of colloid solutions on donor outcomes. Living donor liver transplantation (LDLT) is an established treatment modality for end-stage liver disease and it alleviates the shortage of cadaveric donor organs. This approach to organ procurement greatly benefits the recipient population, although the ethical issues associated with donor hepatectomy and the extreme risks of perioperative morbidity and mortality must always be considered[1-3]. The importance of donor safety during hepatectomy is widely recognized, and potential risks during the perioperative period are a major concern of LDLT. The liver transplantation program at Asan Medical Center began in 1992 with deceased donor liver transplantation and now accomplishes more than 300 LDLTs per year (Figure 1). At our medical institution, perioperative complications associated with general anesthesia and living donor hepatectomy have been reduced and prevented by careful perioperative management as well as by the clinical experience of the anesthesiologists and the surgical staffs. 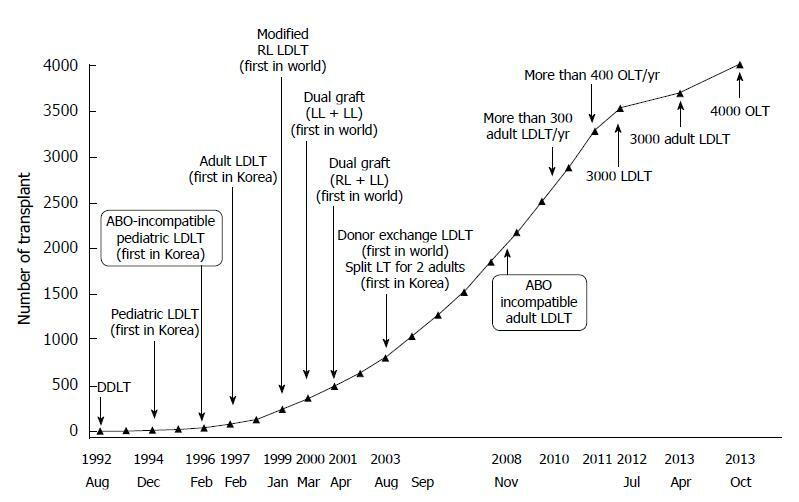 Figure 1 Evolution of liver transplantation at Asan Medical Center, University of Ulsan College of Medicine. From February 1997 to April 2013, 3000 ALDLTs were performed without donor mortality. As of 2010, the annual number of ALDLTs exceeded 300 and with increased performance of ABO-incompatible ALDLT. ALDLT: Adult living donor liver transplantation; DDLT: Deceased donor liver transplantation; LDLT: Living donor liver transplantation; RL: Right-lobe; LL: Left-lobe; LT: Liver transplantation; OLT: Orthotopic liver transplantation. Jan: January; Feb: February; Mar: March; Apr: April; Jul: July; Aug: August; Sep: September; Oct: October; Nov: November; Dec: December. Reprinted with permission. Our article will review the key considerations for the optimal fluid management of living donor hepatectomies for adult-to-adult liver transplantation. These will be based on our clinical experience at Asan Medical Center in Seoul, Korea. We will focus in particular on central venous pressure (CVP) and stroke volume variation (SVV) monitoring and the selection of the appropriate fluid type. In general, hepatectomy inevitably causes a significant blood loss and transfusion requirement, which are among the major causes of post-operative morbidity and mortality[6-10]. In addition to the many surgical techniques which attempt to reduce blood loss during hepatectomy, fluid management to aid in the reduction of operative bleeding has also been developed. Careful fluid management is believed to be one of the important strategies to minimize blood loss during hepatectomy. Various anesthetic methods to reduce blood loss during living donor hepatectomy include acute normovolemic intraoperative hemodilution with autologous blood donation[11-13], intraoperative cell salvage, low CVP technique, and the high SVV method. Of these, fluid management, such as lowering CVP and maintaining high SVV, is simpler and easier to perform as it has no requirement for specific devices, equipment or additional personnel. Following the first prospective report of Jones et al, maintaining a low CVP is widely used to diminish intraoperative blood loss in some anesthetic protocols of hepatectomy[17-19]. Because CVP is thought to reflect hepatic sinusoid pressure, lowering CVP during liver resection can reduce hepatic parenchymal congestion and subsequent blood loss by helping to control hepatic venous hemorrhage[16,17]. It is known that the target CVP during hepatectomy is 5 mmHg or less, and which has been shown to reduce intraoperative blood loss, the need for blood transfusions, morbidity, and mortality[16-18,20]. A low CVP can be simply produced and maintained by fluid restriction, although there is no study evaluating the lowest safe rate of fluid infusion. For example, Wang et al reported that maintenance of CVP ≤ 4 mmHg by reduction of the fluid infusion rate to near 75 mL/h decreased blood loss during hepatectomy and shortened the length of the patient hospital stay without detrimental effects on hepatic or renal function. A low CVP has also been achieved by elective addition of pharmacologic agents such as nitroglycerin[20-22], morphine, milrinone, and furosemide[14,20,24]. In addition, the low CVP technique used during the pre-anhepatic phase of liver transplantation surgery reduces intraoperative blood loss as well as protecting the liver function and having no detrimental effects on renal function. On the contrary, a low CVP strategy was associated with higher mortality and morbidity rates among orthotopic liver transplant recipients. However, several lines of evidence have demonstrated that CVP did not correlate with blood loss during hepatectomy of healthy living donors[13,26-28]. For example, CVP during hepatic resection was not associated with intraoperative blood loss in living liver donors[13,27]. In addition, the amount of intraoperative blood loss was not significantly reduced in donors with relatively low CVP during living donor hepatectomy[26,28]. An evaluation of nearly 1000 living liver donors in our medical institution has revealed that factors associated with intraoperative blood loss were patient gender, body weight, and fatty changes in the liver, although not the CVP level during hepatectomy. Furthermore, Niemann et al found that blood loss was similar in donors with and without CVP monitoring, and thus suggesting CVP monitoring may not be necessary in a highly selected patient population, such as living donors. It was also reported that CVP did not correlate with the preload status in normal healthy volunteers. Discrepancies regarding the usefulness of the low CVP technique to reduce blood loss may arise from differences in patient populations. The hemorrhagic tendency of liver tissue in patients with benign or malignant hepatic lesions may differ from that in healthy living liver donors. In various surgical situations, CVP measurements may be inaccurate, although the correct measurement of CVP is crucial for its proper application. A critical review has assessed the correct placement of pressure transducer for CVP measurement in the physiological context. The authors of this review used a questionnaire among intensivists and anesthesiologists in order to determine the correct alignment of the pressure transducer to the phlebostatic axis (a horizontal plane through the tricuspid valve). Surprisingly, only 3.4% of the respondents identified the correct phlebostatic axis for CVP measurement. Furthermore, 45.6% of the respondents mentioned that CVP had no clear-cut relation to the intravascular volume status or to changes in volume. CVP can be affected by factors, including the patient position, surgical liver manipulation, intrathoracic pressure [including positive end-expiratory pressure (PEEP)], pulmonary disease, tricuspid valve disease, pericardial pressure, and intra-abdominal pressure[30-32]. Indeed, during hepatectomy, liver manipulation, occasional clamping of the inferior vena cava (IVC), hepatic veins or even the portal vein by the surgeon, and relatively frequent patient position changes can cause confusion regarding the correct measurement of the CVP value. It has also been noted that head-down tilting is frequently used during maintenance of low CVP[20,21]. Sand et al[22,33] reported that there was a dissociation between CVP and hepatic venous pressure in a head-down tilt (Trendelenburg’s position) at both 5 cmH2O PEEP and zero end-expiratory pressure. They suggested that CVP cannot be used as a surrogate for both portal and hepatic venous pressures in the head-down position. More importantly, potential fatal consequences of the low CVP technique during hepatectomy include air embolism and unnecessary hypoperfusion[21,34], although a head-down tilt position is frequently used to prevent possible air embolism and to improve the venous return[21,22]. It can be reasonably expected that a negative CVP can allow large volumes of air through small or unrecognized, opened hepatic veins during hepatic parenchymal resection. In fact, an earlier report by Jones et al also documented that a small air embolism was suspected in two patients (5% of patients maintaining a low CVP). It should be also kept in mind that central venous catheterization is associated with its own morbidity[35,36]. The overall complication rate of central vein catheterization was from 5% to more than 26% in patients who were recommended for treatment or monitoring. Even in living liver donors, central venous catheter-related thrombosis has been observed. Taken together, it is suggested that a low CVP technique used during living donor hepatectomy may not be advantageous regarding the safety of healthy living donors undergoing hepatic resection. Safer, simpler, and more useful fluid management methods are, therefore, required in order to reduce blood loss and subsequent morbidity during living donor hepatectomy. SVV is one of the dynamic parameters of hemodynamic monitoring used to access the volume status and fluid responsiveness in mechanically ventilated patients. SVV is currently accepted as a simple and sensitive indicator for evaluating fluid responsiveness and the preload status in various clinical settings[38-44]. Our group found that SVV may be an independent hemodynamic predictor of intraoperative blood loss ≥ 700 mL, as well as being a valuable functional preload index during living donor hepatectomy. 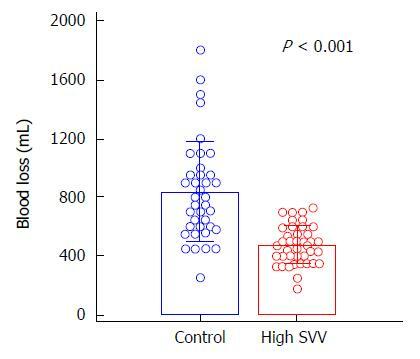 Dunki-Jacobs et al demonstrated that CVP values significantly correlated to SVV value, thus implying that SVV can be used as an alternative to CVP monitoring during hepatic resection in patients with diseased, but not normal, liver. The usefulness of the SVV value was also reported in patients undergoing laparoscopic liver resection. Kitaguchi et al found that CVP of -1 to 1 mmHg was significantly correlated to an SVV of 18%-21% (R2 = 0.85, P < 0.001), and thus indicating a safe alternative to CVP monitoring during hepatic resection and with equivalent outcomes in blood loss. In addition, when IVC with or without the portal triad was clamped during hepatic resection, the SVV was significantly higher in patients with lower blood loss than in those with higher blood loss. Therefore, SVV may be used as a guide for fluid management in order to reduce blood loss during living donor hepatectomy. To demonstrate this concept, we recently performed a randomized controlled study and compared the effects of SVV 10%-20% (high SVV) and < 10% SVV (control) on blood loss during living donor right hepatectomy. The mean blood loss during living donor right hepatectomy was remarkably lower in the high SVV group than in the control group (475.5 ± 131.2 mL vs 835.5 ± 341.1 mL, P < 0.001; Figure 2). There was also no significant between-group difference observed in the perioperative laboratory values such as hemoglobin, the lactate and creatinine levels, liver function test, and coagulation profiles, the incidence of intraoperative hypotensive episode and mean arterial blood pressure during hepatectomy. Neither group of donors experienced renal failure or death. All donors were discharged from the hospital without any major complications. Figure 2 Effect of stroke volume variation-directed fluid management on blood loss during living donor right hepatectomy. The control group (< 10% SVV) received usual fluid management (6-10 mL/kg per hour during surgery), whereas the high SVV group underwent fluid restriction (2-4 mL/kg per hour until completion of hepatectomy) with SVV ranging from 10% to 20%. Blood loss was significantly lower in the high SVV than in the control group. SVV: Stroke volume variation. Reproduced data with permission. We determined high SVV as 10%-20% based on previous studies[41,44] and our numerous experiences with living donor hepatectomy over 20 years. In our previous study, the median SVV of the high SVV group was 11.7% (11.0%-13.0%) [vs 5.3% (4.7%-6.3%) in the control group] and was safely maintained. Therefore, in order to reduce blood loss during living donor hepatectomy, we propose a fluid management technique using a high SVV method. SVV can be safely maintained at 10%-20% with simple fluid restriction and optional administration of a small dose of diuretics during living donor hepatectomy, in accordance with our previous study results and clinical experience. A proposed fluid management algorithm during living donor hepatectomy is shown in Figure 3. Figure 3 Proposed algorithm of stroke volume variation-guided fluid management during living donor hepatectomy. SVV: Stroke volume variation. Modified with permission. Neither replacement of a volume deficit from fasting nor compensatory intravascular volume expansion is conducted prior to induction of anesthesia when using our protocol. Donors’ lungs are mechanically ventilated in order to maintain a constant tidal volume of 8-10 mL/kg. We do not apply PEEP during mechanical ventilation because SVV is obviously influenced by PEEP[49,50]. After anesthesia induction, fluid restriction is begun and is continued until the completion of hepatectomy. The fluid is administered intraoperatively using crystalloid (plasmalyte) and colloid solutions (albumin). Colloid solution is administered only after hepatectomy for volume replacement. 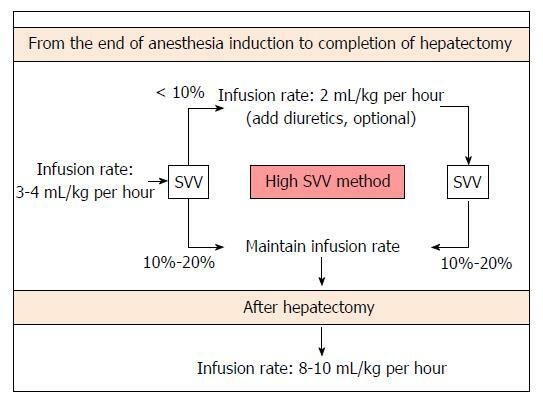 At first, fluid administration is restricted with the infusion rate of 3-4 mL/kg per hour until completion of hepatectomy in order to maintain an SVV of 10%-20%. If the donor’s SVV was < 10% during this period, the infusion rate was decreased to 2 mL/kg per hour and furosemide (max. 40 mg) was optionally administered according to the clinicians’ decision. After completion of hepatectomy, fluid replacement is maintained with the infusion of a colloid or crystalloid solution at a rate of 8-10 mL/kg per hour. Systolic arterial blood pressure is maintained at ≥ 90 mmHg. If systolic arterial blood pressure decreased further < 80 mmHg during donor hepatectomy, ephedrine and additional fluid are administered. Urine output is maintained at ≥ 0.5 mL/kg per hour. Hemoglobin concentration is maintained at ≥ 7 g/dL; if the hemoglobin concentration is < 7 g/dL, transfusion of packed red blood cells is planned. Furosemide may be optionally administered in order to achieve high SVV according to our protocol. However, furosemide may induce acute kidney injury. Several reviews in diseased subjects have found that rapid or early excessive fluid removal using diuretics, and which leads to hypovolemia, may be associated with an increased risk for acute kidney injury[51,52]. In addition, furosemide has not shown significant clinical benefits in the prevention or treatment of acute kidney injury[51,52]. In our recent clinical trial, healthy living liver donors showed no significant changes in perioperative serum creatinine levels regardless of furosemide administration. This discrepancy may be related, at least in part, to the investigated population. Although a relatively small dose of adjuvant furosemide may be used with care in order to maintain high SVV in healthy living donors, further studies concerning effective and safe alternative drugs for maintaining high SVV of 10%-20% will be required. We reported in a large cohort study that the preoperative hemoglobin level and graft-to-donor weight ratio were useful independent predictors of blood transfusion in living donor hepatectomy. Preoperatively moderate anemia (hemoglobin < 11 g/dL, but ≥ 8 g/dL) was observed in 1.4% of living liver donors. Thus, the high SVV method can be recommended for living liver donors with risk factors such as anemia in order to reduce blood loss during donor hepatectomy as well as subsequent blood transfusion requirements. However, this parameter has several possible limitations because SVV utilizes cardiorespiratory interaction over a mechanically ventilated respiratory cycle[43,54-56]. First, the patient must be mechanically ventilated without any spontaneous breathing. Second, the tidal volume should be ≥ 8 mL/kg of the ideal body weight. Third, several clinical conditions, such as cardiac arrhythmia, preclude the use of this parameter. Numerous recent reviews and meta-analyses have reported that synthetic colloids than crystalloids or albumin seemed to increase the need for renal replacement therapy and blood transfusion and resulted in more serious adverse events while providing no overall clinical benefits for critically ill or septic patients[57-63]. However, it is uncertain whether the intraoperative use of colloid solution is associated with similarly adverse effects in patients undergoing surgery, as shown Table 1. A meta-analysis of 17 randomized studies evaluating the renal safety of hydroxyethyl starches (HES) 130/0.40 in surgical patients observed no evidence of renal dysfunction. Another meta-analysis from Gillies et al found no difference in the incidence of death or AKI in surgical patients receiving 6% HES. However, they did not recommend the use of 6% HES solution in surgical patients because of the absence of demonstrable benefits. Cytokines and other inflammatory mediators produced in a septic condition can induce gaps between endothelial cells, thus resulting in microvascular leak and tissue edema. Because the endothelial permeability of septic patients differs from that in the healthy population, harmful or no beneficial results from these critically ill patients cannot be extended in living liver donors or elective surgical patients. In trauma patients having similar pathophysiology as that of surgical patients, it has been reported that fluid resuscitation with colloid solution decreased both the morbidity and mortality[67,68]. Currently, there is few report evaluating the outcomes of the intraoperative use of colloid solutions in living donors undergoing hepatectomy. Further studies will be required in order to demonstrate either the significant benefits or harms associated with the administration of synthetic colloid solutions in living liver donors. Therefore, administration of colloid solution should be carefully determined depending upon each clinical situation of living donor hepatectomy. Table 1 Controversial effects of intraoperative colloid administration on the outcomes of surgical patients. 3Mainly 6% hexastarch 670/0.75. AKI: Acute kidney injury; Alb: 5% human albumin; HES: Hydroxyethyl starch; NS: Normal saline; RA: Ringer’s acetate solution; RCT: Randomized controlled trial; RL: Ringer’s lactate solution. Crystalloid solutions are extensively used to maintain and replace the intravascular volume in a variety of surgical procedures performed under general anesthesia. When a large amount of normal saline containing no buffer or other electrolytes is administered during surgery, a hyperchloremic metabolic acidosis can result, thus causing increased morbidity and a longer hospital stay following major surgery[69-71]. In living liver donors, normal saline administration during hepatectomy may be detrimental due to its association with hyperchloremic metabolic acidosis[26,72]. Ringer’s lactate (RL) solution which contains 28 mmol/L of lactate and has a pH of 6.5, is one of the most preferred crystalloids due to its similar electrolyte composition to extracellular fluid as well as its buffering effect. However, it has been shown that the infusion of a large volume of RL solution during major spine surgery caused postoperative mild hyponatremia and respiratory acidosis, although it did not induce hyperchloremic metabolic acidosis as does normal saline. A recent report conducted following major abdominal surgery found that total infused saline and the lactate level were independent factors related to metabolic acidosis. Due to the increased concentration of lactate after living donor hepatectomy, the RL solution should be carefully infused in living donors undergoing extensive hepatic dissection. Because hepatic blood flow and the capacity of the liver to metabolize lactate may change during and after hepatectomy, additional administration of exogenous lactate may increase the lactate concentration. Shin et al reported a prospective study comparing the effects of two, crystalloid solutions with and without lactate on the liver function test data and the serum lactate level in living donors undergoing right hepatectomy. In that study, median lactate concentrations 1 h after hepatectomy were significantly higher in donors with RL solution than with the plasmalyte, a balanced solution of pH 7.4 and containing acetate and gluconate (rather than lactate) as bicarbonate precursors [4.2 (3.2-5.7) mmol/L vs 3.3 (2.6-4.6) mmol/L, respectively]. Therefore, the use of non-lactate-containing crystalloid solution, such as plasmalyte, is advisable during living donor hepatectomy in order to avoid induction of hyperlactatemia and hyperchloremia[5,76]. The importance of precise fluid management in order to reduce blood loss during hepatectomy in healthy living liver donors cannot be overemphasized. Although a low CVP technique may be still effective, we propose the high SVV method, i.e., maintaining 10%-20% of SVV for fluid management in order to reduce blood loss during living donor hepatectomy. The non-lactate-containing crystalloid solution is also advisable for use during living donor hepatectomy. However, intraoperative administration of synthetic colloid solution should be carefully determined depending on each clinical situation of living donor hepatectomy. Future studies will be required in order to elucidate the effect of colloid solutions on the outcomes of living liver donors undergoing hepatectomy. The authors thank Professors, Gyu-Sam Hwang (Department of Anesthesiology and Pain Medicine), Sung-Gyu Lee, Shin Hwang, and Clinical Associate Professor, Tae-Yong Ha (Division of Liver Transplantation and Hepatobiliary Surgery, Department of Surgery, Asan Medical Center, Seoul, South Korea) for preparing this review article.